Escape the beach and head for the hills on this exciting Koh Samui Island Eco Safari Tour, trail the natural landscapes and wildlife preserves on this idyllic island while getting to know your personal tour guide, a beautiful and majestic elephant. Begin your amazing journey through the lush jungle with an elephant ride at the centre of the island. You will learn all about the amazing elephants and how they are cared for by their carer, which will be noticed by the wonderful bond the elephant and their carer have. Your elephant ride will take you to a special display featuring the elephant and monkey families, before continuing on the back of an Ox-cart to a village surrounding coconut palms. You will be taken on a discovery through the tastes and smells of local Thai cooking. Watch as your chef cooks and prepares traditional local food, in particular Thai curry. For another local spectacle, you will get to watch the locals tapping rubber trees, which is one of the island’s biggest resources. The last part of the tour takes you through the tropical jungle where you will get the chance to cool down at a waterfall. After trekking through the tropical jungle you will head off for some traditional lunch or dinner. The Koh Samui Island Eco Safari Tour begins at 8.45 am or 2.45 pm and lasts around 6 hours. 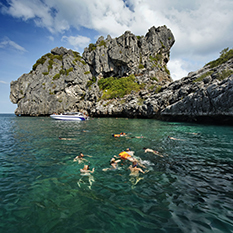 Are you interested in adding the Koh Samui Island eco Safari Tour into your Thailand honeymoon? Contact us today!